Overview :Experience the best looking version of Guerrilla Bob, QVGA optimized! 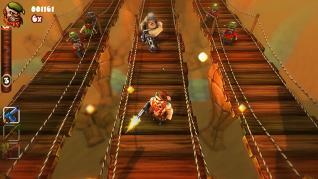 Guerrilla Bob offers stunning visuals, cross-platform multiplayer, an arsenal of kick-*** weaponry, unique enemies, explosive ammunition and non-stop humor. This version of Guerrilla Bob is optimized for use on QVGA Android devices only. Split-Screen multiplayer: play a CO-OP game together with a friend, on the same device! 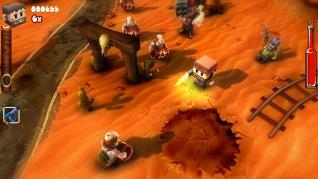 Dive into the Story Campaign where Guerilla Bob fights through dangerous canyons, steep deserts and dreadful towns. The story mode is split into Arcade mode, where Bob fights for fame, and Mercenary mode, where Bob fights for fortune. Alternatively, engage in Classic Survival Mode where endless enemies come at Bob from all directions in a closed arena environment. In Wave Attack Mode you fight waves of baddies and access the shop to purchase new arsenal. Extra difficulty modes are for players who think theyâ€™re experts!